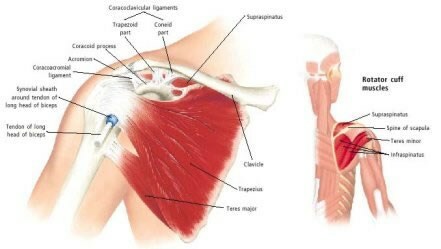 The shoulder is a complex structure composed of muscles, ligaments, tendons, bones and joints that we use extensively. Shoulder injuries can happen in many sports such as racquet sports, swimming, ball sports as well as repetitive manual labor and office jobs. The shoulder is easily injured in contact sports such as football or snowboarding where it can be dislocated. As with all injuries, it is imperative that shoulder problems be treated early, as the longer they are left the more difficult rehabilitation becomes. This injury is very common in all contact sports and involves a fall onto the shoulder, elbow or outstretched hand. One common cause is during a hard bump in Australian Rules football. Depending on the severity the outside end of the clavicle will be pushed upwards (PICTURE). This injury is caused by tearing of the ligaments around the A-C joint and involves partial separation (Grade I and II) or total separation (Grade III) of the joint. 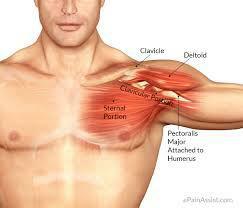 There is pain and tenderness around the outer end of the clavicle that is increased by movement. This problem is commonly referred to as ‘frozen shoulder’. This is an ongoing shoulder problem which can occur in the older person as a result of any shoulder injury. 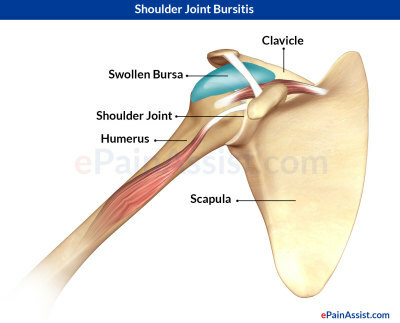 It is characterised by a period of marked pain and inflammation in the shoulder closely followed by marked stiffness and loss of range of movement in the shoulder. 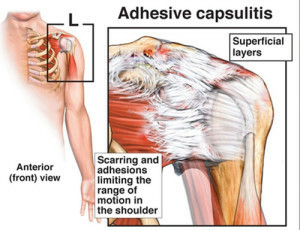 It is due to a buildup of scar tissue and contraction of the ligaments around the shoulder following the painful inflammation. Clavicle injuries are very common in contact sports and cycling, skiing or horse riding. This fracture usually results from a fall onto the point of the shoulder, onto an outstretched hand (PICTURE) or from a direct blow. The clavicle will usually break in the middle third of the bone or towards the outer third. The fracture will be characterised by extreme localized tenderness and swelling, and sometimes a cracking feeling with arm movement. The bony deformity is easily felt in this case. Acute dislocation is common with a fall onto the outstretched hand or a direct blow to the front or back of the shoulder. Dislocation is characterised by extreme pain and spasm in the shoulder as well as visible deformity and inability to lift or move the arm. 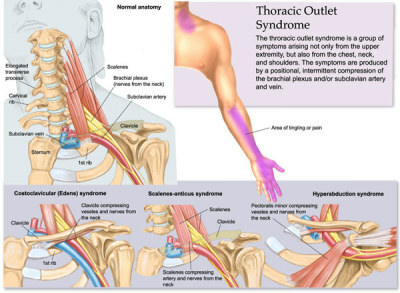 A temporary numbness and weakness of the arm is sometimes felt – a symptom commonly called ‘dead arm syndrome’. The rotator cuff is made up of four muscles the subscapularis, supraspinatus, infraspinatus and teres minor. Which attach the scapula to the upper arm. The tendons blend around the shoulder joint to provide stability around the shoulder joint when the arm is being used. Another main function of the rotator cuff is to provide rotation of the arm at the shoulder joint. 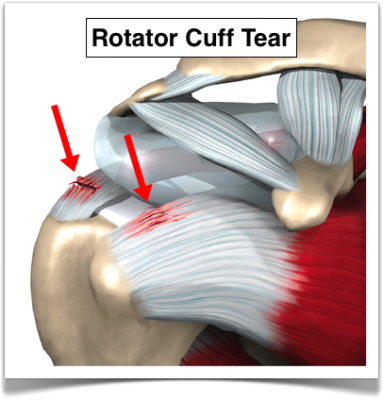 This is the most commonly injured tendon of the rotator cuff. 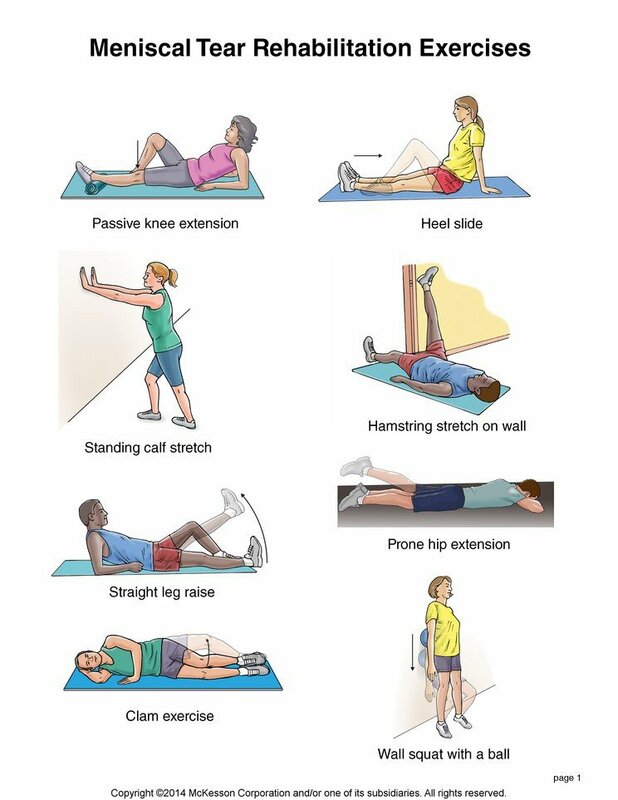 It is most commonly done in older athletes, competing in racquet or throwing sports after a period of inactivity. Injury may also occur when falling onto the shoulder or lifting or throwing a heavy object. Intense pain will be felt in the shoulder upon injury with subsequent pain ‘jabs’ when the arm is lifted outwards and upwards or rotated away from the body. Pain may also extend down the outside part of the upper shoulder (over the deltoid muscle). 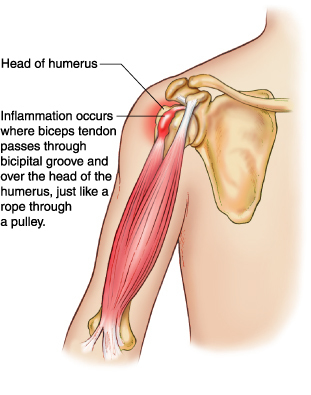 In this case the rotator cuff tendons become inflamed and swollen over a period of time. This injury is common in swimming, especially freestyle or butterfly, or any activity that involves repetitive raising and/or rotation of the shoulder. The injury is characterised by pain with overhead activity ‘deep’ in the shoulder. Activities where the shoulder is below 90 degrees of elevation may be pain free. Pain may also be felt when pressure is applied to the front of the upper part of the shoulder. Another common symptom is weakness when raising the arm away from the body to the side at an angle of 90 to 120 degrees from the body. This injury is common in people who do a large amount of weight training, including ‘bench press’, ‘curls’ and ‘dips’. Pain in the upper front part of the arm above the biceps muscle is common and pain will be made worse by resisted bending of the elbow. In extreme cases or in the older population, rupture of the biceps tendon is possible, characterised by pain during the activity and a tearing sensation above the biceps muscle bulk. Shoulder pain that is referred from the neck may or may not be accompanied by pain or stiffness in the neck and/or upper back. The pain in the shoulder may follow injury to the neck such as whiplash or may be accompanied by long term or sustained poor neck and upper back posture. Referred pain in the shoulder may also be accompanied by pins and needles, loss of strength, sensitivity or pain in any other part of the upper limb such as the elbow, wrist or hand. Proper diagnosis should be obtained before treatment options are explored. 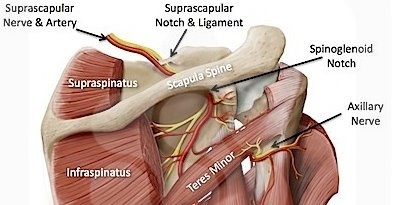 The suprascapula nerve can be damaged with scapula fracture, forward or backward shoulder dislocation, or by repetitive external pressure over the scapula such as with a backpack. Symptoms include pain around the upper back part of the shoulder, weakness with outward rotation of the shoulder and elevation of the shoulder to the side through 80deg-120deg. This is a tear of the cartilage rim that provides stability in the shoulder joint. 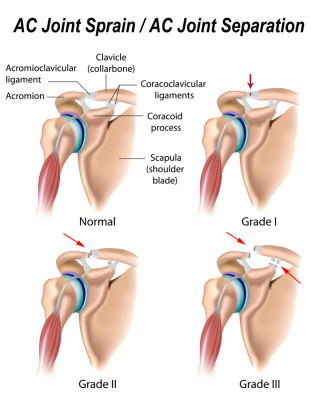 This injury commonly occurs with forward dislocation or subluxation of the shoulder, although it is possible to injure the Glenoid Labrum in children without instability of the shoulder. This injury is characterised by deep pain in the shoulder usually located towards the front of the shoulder, a clicking, popping or locking in the shoulder with movement, instability and/or a decrease of range of movement. Inflammation of the fluid filled sac(supraspinatus bursa) below the supraspinatus tendon is subacromial bursitis. This can be caused by a fall on the shoulder, a blow to the top or front of the shoulder, injury to the supraspinatus tendon or repetitive use of the shoulder such as with reaching. It is characterised by pain in the front and/or upper part of the shoulder aggravated by lifting the arm outwards and rotating the arm.